Customer Projects - Europe - Devoran Garden Gabions Ltd. Here at Devoran Gabions we love seeing how our customers transform their gardens using the gabions they buy from us. 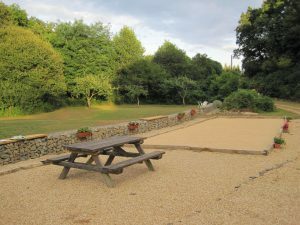 From small seating areas to full scale retaining walls and flood defences, we always enjoy receiving customer photos and feedback! This year our BBA approved gabions have been shipped to various destinations across Europe including Luxembourg and France. 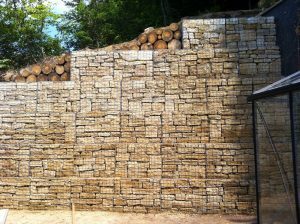 This impressive retaining wall in Hobscheid, Luxembourg was delivered to a customer who needed to retain a large embankment at the back of his property. 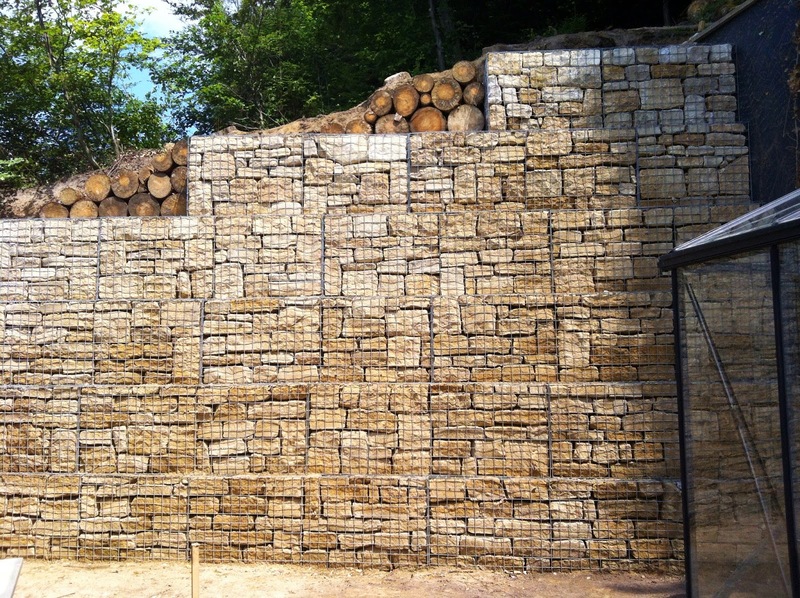 The wall was designed using our 4mm galfan gabions which have been stepped at each course. The size of stone that he has used is perfect as it gives a very professional finish to the wall and ensures stability and structure throughout the design life. To maintain a good aesthetic we advise that you use 4mm facing panels for walls exceeding 3m high. Large gabion wall retaining a crumbling embankment in Hobscheid, Luxembourg. 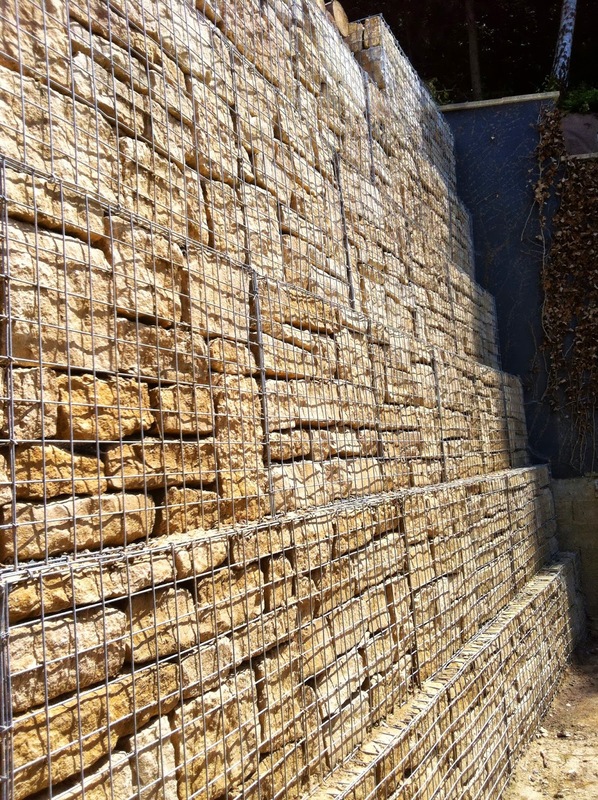 Gabion wall that has been stepped at each course to improve stability. 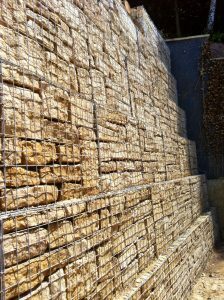 Gabions have many uses, and not all walls need to be as high as the one above to make a difference. The gabion wall below, which spans over 35m long, has been built in Brittany, France to protect this customer’s property from flooding. He comments, “your product is very good and the wall is going well; it is hard work for one person but good for the muscles”. The wall is still under construction but we especially love how he has incorporated seating areas and brightened the gabions with flower baskets. 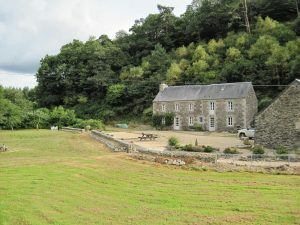 Gabion wall built to protect a property from flooding in Brittany, France. Brighten any gabion wall with flower baskets and seating areas.